This Caterpillar is quite handsome: it is white with four rows of purplish brown spots along the back, and a brown head and collar. It grows to a length of about 1 cm. It is a pest of any stored foodstuff, particularly fruit, and especially grapes. It really prefers grapes that are damaged already and still moist. 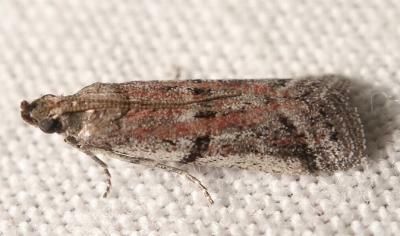 The adult moth has fawn forewings and pale hindwings. It has a wing span of about 2 cms. The mating behaviour has been investigated, and some of the pheromones have been determined. the crystallised toxin from the bacterium Bacillus thuringiensis ( BACILLACEAE ). Volume 5 (1871), p. 385.